Archery, Badminton, Baseball, Basketball, Beach Vball, Boxing, Canoe, Cycling, Diving, Equestrian, Fencing, Field Hockey, Gymnastics, Judo, Modern Pent, Mountain Biking, Rhythmic Gym, Rowing, Sailing, Shooting, Soccer, Softball, Swimming, Swim, Table Tennis, Taekwondo, Team Handball, Tennis, Track & Field, Trampoline, Triathlon, Water Polo, Weightlifting, and Wrestling. In 1996, the Summer Olympic Games were held in Atlanta, USA. In 1998 the Winter Olympic Games were held Japan. In 2000 the Summer Olympic Games were held in Sydney, Australia. 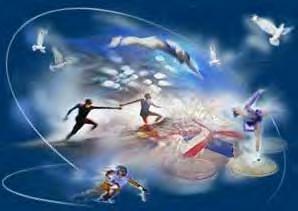 In the year 2002 the Winter Olympic Games will be held in Salt Lake City, Utah. As we know, the Olympics were held every four years. Today, they are held all over the world but, in the beginning. They were held in the Olympia, Greece. These days we play tons of games at the Olympics but at the first Olympics they only had one event. That was the sprint. Now you learned that the Olympics were held to honor the ancient Greek gods. Becoming an Olympic Medallist is really hard and takes lots of work. Now, if you go to an Olympic games, you can tell the person you sitting next to the history of the Olympics.